They tell people looking for a career that it should be something they love to do. It’s best to get paid to do what you love. If you love animals, you might as well get paid to love and take care of them. Starting a pet sitting business can allow you to make more money on the side. When a pet owner goes on vacation, they will call you to come & take care of their pets while they are away. You can even earn extra money from home if you take the pets home to stay with you. Caged animals such as hamsters and rabbits would work out better this way, anyway, and are easy to transport. If you love animals and you’re looking for a good money making idea, there are several options such as grooming or caring for animals. You can start a pet sitting business that will allow you to enjoy animals and make money doing it. Pet sitting has become more and more popular. Pet owners don’t want to leave their pets alone when they are away on vacation, on business, or for other outings. Sometimes they are just too busy for an amount of time and they don’t want their pets to be neglected. They don’t want to leave their pets with just anyone, either. 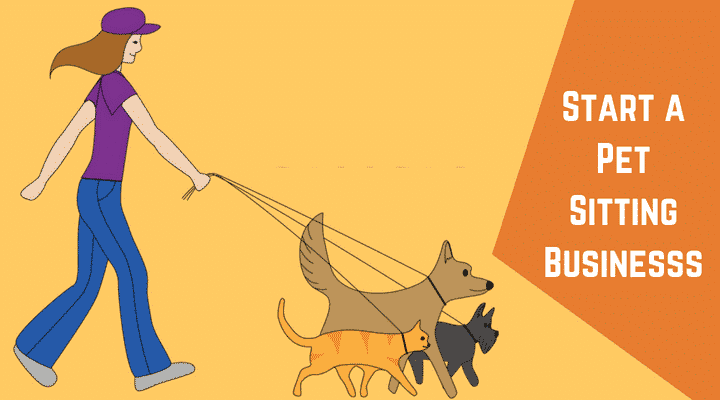 A pet sitting business can become a very large business, but it’s best to start small. You may also choose to keep it small as a side business even in the future, which is perfectly okay, too. A business doesn’t have to be huge to be successful and enjoyable. Starting a small pet sitting business can work in several different ways. In home pet sitting means you watch the pets in the owner’s home. This depends largely on what type of pet it is and what the owner prefers. Some pets are easier to take care of by leaving them in the owner’s home, and others can be taken home with you. Cats and dogs can typically stay in their owner’s homes. If you’re pet sitting, you can stop by once or twice a day to feed the pet, walk them, take care of them, etc. If you live nearby, this isn’t too much of an inconvenience. For example, if your neighbour across the street needs you to take care of their cats while they are away on vacation, you can easily walk over. However, the farther away you are, the more likely it might be better to take the pet into your home. Driving 30 miles there and back twice a day will cost you a lot of money and time. Small, caged pets, such as rabbits, hamsters, guinea pigs, birds, ferrets, etc. can easily be taken to your home. They require less care and space, and they are easy to bring home and back. If you go to the owner’s home to take care of the pet, you may also be asked to house sit. This means taking care of their home while they are away which may include things such as getting the mail, taking care of the pool, etc. If you’re expected to take care of the house also, you should charge more. You can also live in the house, which could fix the distance problem if you’re far away. Of course, this is assuming it doesn’t mess with other distances such as the distance to your day job if you have one. In most cases, the pet resources are provided by the owner. You probably won’t need to buy dog food or kitty litter unless you’re expected to watch the animals for a prolonged period of time such as weeks or months. If this is the case, the cost can be factored into what you charge. Make sure you have all the resources from the start, even if the owner provides them. Ask them what you will need to care for their pets, and ask them if there is a large enough supply for the time necessary. You don’t want to get stuck running to the store if you don’t have to. If you’re taking the pets into your home, you will need resources to protect your home and take care of the animal. For example, if you don’t have dogs and you take one in, they may end up with some extra mess that could be prevented by taking the right precautions. Of course, if you love animals, chances are you already own some pets at home, and bringing new ones into your home is only a treat you’re already prepared for. You can’t have a successful pet sitting business if you don’t have any clients. The first place to look is within your own friends and family. Tell everyone you know you’re available for pet sitting. Let them know which kinds of pets you can care for. Add house sitting as an offer as well. Some owners might not have thought of this and will be pleased if you offer the service. Think about where pet owners go with their pets. Do you know a dog groomer? Ask them if you can hook up your services. You can refer clients to their grooming services while they can refer their clients to your pet sitting services. Go to pet shops, dog walking parks, and other animal hot spots and look for bulletin boards to hang up fliers. Make fliers and business cards look professional so that potential clients take you seriously. Always tell clients about your vast experience with animals and pets and how you will take care of them. Ask existing or past clients for testimonials and add them to your website. Make a website detailing your services and advertise it on Facebook, service sites, the yellow pages, etc. When someone is interested in your services, always meet with them and their pet first. Get to know their pet and make them feel comfortable. Show they how good you are with animals. Always do a great job so that happy customers return again. How many times do you need to visit the pet? Do you need to give it any medications? How far away do they live from you? Are you expected to do anything else such as getting the mail? Does the animal have any special needs? Talk to other pet sitters in your area to find out what they are charging. Use these rates as a jumping off point. If you have less to offer (such as qualifications), charge less. Over time as your business builds, you can use your experience to gain more clients and raise your rates. If pet owners are knocking down your door because they love your services, they’ll be willing to pay more, too. Expanding your business into full time territory is a big deal, but if you love animals and you love this industry, you can be very successful. As you migrate from in home pet sitting to having your own kennel or resort to keep the animals, you’ll have more and more to take care of. For example, you’ll need to be bonded and insured, have a business license, find a location to buy or rent, etc. Expenses can build up fast, but if you build a good business plan and have experience under your belt, success will come. Another expansion idea is to add more services such as dog grooming, a pet store, etc. As your business grows, new ideas will come to you. Having happy clients to start will make expansion easier and more successful because you already have trust with your customers. Use it to your advantage. If you’re serious about having your own pet sitting business and you want more information, I highly recommend picking up a copy of The Real Poop Scoop on Pet Sitting: Create Financial Freedom Playing With Pets! and How To Open & Operate a Financially Successful Pet Sitting Business. Both of these books are great resources filled with experience, tips, and tricks to starting a successful pet sitting business. You can buy both of these books for a low price through Amazon.com and start a pet sitting business. i wand to do make business of pat,where i live people like pets more than people here,can u help me aboud that?